Podcasts are one of the fastest growing and most innovative forms of entertainment on the internet today. They come in all shapes and sizes, covering all kinds of topics and hosted by all kinds of people. The biggest names in YouTube have them. BBC Radio programs use them as extra content. It’s hard to escape them. And the appeal is easy to see; the broadness of them means that there genuinely is one for everyone. They’re a unique space to exhume the medium of talking into something that can be entertaining and funny or hard-hitting and informative. And because they’re almost purely just about conversation, they’re very easy to get going. All you need are some microphones, some editing software and enough stuff to talk about for 30 or so minutes. On Xpress Radio, we have a whole section just for podcasts under the Creative Arts section, and we are totally, completely and absolutely open to all and any ideas. We really cannot emphasise how easy they are to make and how much fun they can be to do, whether it be sport, comedy, gaming, music or more. They’re an especially good way to get into audio content if going live on air is a bit daunting (which, let’s be real, it is) and you fancy having some extra time to edit out any mistakes. 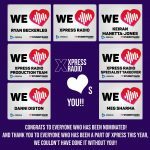 We’re going to be promoting Xpress’s podcasts on these website posts over the coming semester to show just how easy they are to make and how they really can be about whatever you want. If you’re interested in doing one, head over to the Creative Arts Facebook Group Page and you can get in contact with Alys and Munro, Xpress’s Creative Arts execs, who can help you turn your idea into a full-blown show.